Perfect with leftover Christmas meats. Cover the potatoes with cold water in a pan and bring to the boil, then simmer for 15-20 minutes or until completely tender when pierced with the tip of a sharp knife. Strain the potatoes and add the butter and milk, mash well to ensure there are no lumps. Add the sprouts to the mashed potato and add the flour and seasoning, pour in the beaten egg. Using your hands combine all the ingredients together and turn out on to a lightly floured surface. Use a rolling pin to flatten the mixture and take a scone cutter or ramekin to cut the mixture. Set aside. Drizzle a frying pan with the olive oil and place the patty shapes onto the pan. Cook on each side for 4–5 minutes and remove from the pan. 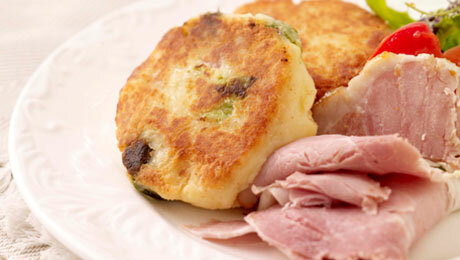 Serve with some slices of leftover ham or turkey, delicious!